I really love living here. The location is great, close enough to downtown but also not far from the I drive area too. The apartments are really spacious and the amenities are great! Thank you for taking the time to review Heritage on Millenia. We are so happy to hear that you are enjoying living here at Heritage. Great living community. Always keeps the community kept up! Great apartment complex to have a pet. Maintenance is always helpful and quick when responding. Thank you for taking the time to give us a review. We appreciate your compliments about the staff and community. Thank you again for your comments, as well as your continued residency. Staff in heritage on millennia are very friendly. Very clean community. Affordable price. I have been leaving year for last 2 years and never had any issue. Thank you for taking the time to review Heritage on Millenia. We are happy to hear that you are enjoying living here at our community. Great location, fairly quiet (aside from lawn maintenance day) and everyone in the office is always helpful. My only complaints would be the parking, especially when there are no restrictions to the amount of guests you have staying with you. Thank you for taking the time to review Heritage on Millenia. We appreciate your feedback. I rate this place five stars. Love this place, it is my home. Carefree safe living. Great staff who watch over the residents and keep the property clean and beautiful. Thank you for taking the time to review Heritage on Millenia. 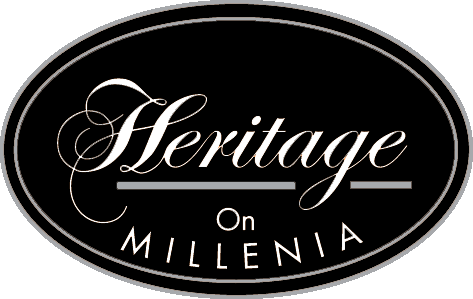 Long term residents, like yourself, let us know that Heritage on Millenia is truly a home and not just "an apartment". It is our pleasure to do all we can to make your home happy and comfortable. The community and the staff are great. Everyone is friendly and if I have an issue, it is resolved quickly and professionally. I would recommend this community to friends. Thank you for taking the time to review Heritage on Millenia. We appreciate your kind comments and are happy that you decided to call Heritage home. I am enjoying my residencey here at Millenia. The stagf is always accomdating the property is always beatiful and residents ate nice people. Thank you for taking the time to review Heritage on Millenia. We are so happy that you are enjoying living here at our community. Lived here for almost two years now and I am very glad I Chose this community. All Staff members including maintenance are super nice and heritage on millenia is a great place to live . We appreciate your compliments about our staff and community. We are so happy that you are enjoying living here at Heritage. Thank you again for your comments, as well as your continued residency. Everything is good so far, except the lacking of parking spaces. I also hope that the rent will not go up so dramatically on the next renewal as it was in the last year. I thought this would be a great neighborhood when I moved in and for the most part it is but there are people who leave their dog waste outside of the dog park, I have had my car written on by a fellow neighbor, and there is NEVER any parking EVER!!! And when you bring any issues to the front office they never care. Also the computer lab and movie theater should be open later. Thank you for taking the time to review Heritage on Millenia. We understand that each person has a different living experience at Heritage on Millenia and we appreciate your constructive feedback. Thank you for taking the time to review Heritage on Millenia. We are happy to hear that you are enjoying living here at Heritage. The apartment has been a satisfying experience so far. The only complaint is that the Gym is too small and equipment are also very less. Kindly add more Dumbbell sets. Thank you for taking the time to review Heritage on Millenia. We are happy to hear that you are enjoying living here at our community. We appreciate your feedback. Been here for 3 yrs now no complaints! Will renew for the 4th year! Wonderful management! Quick responses too! Quiet neighborhood and we feel secure here! I have lived here for three years and I am very satisfied. The staff is very friendly and helpful. Best of all is that if repairs or maintenance is needed, they respond right away to fix as necessary. Thank you for taking the time to review Heritage on Millenia. We are so happy to hear that you are enjoying living here at Heritage. We appreciate your compliments about the staff. So far I like the community being gated and the peace and quiet. If everything works out well, I will probably renew my lease at the end of the year. Thank you for taking the time to review Heritage on Millenia. We appreciate your comments and are glad that you decided to call Heritage home. Good place to live. Been here 3 years and they have been consistent. Helpful and friendly staff; well maintained and clean property; dog welcoming and friendly atmosphere. We appreciate your compliments about the staff and community. We are so happy that you are enjoying living here at Heritage. Thank you again for your comments, as well as your continued residency. The community is ok, feel safe here, staff is friendly most of the time. Sometimes when I need something or need to call the office, a lot of the time no one is in the office. Takes a while to get a hold of someone. We love it here the staff is friendly and always willing to help with any issues. The community is very safe and quiet and most of all well maintained and that's what we love the most! Thank you for taking the time to review Heritage on Millenia. We appreciate your kind comments about the staff and community. Upkeep of the hallways and stairs is pretty bad, but overall a good living experience, just wish that the buildings were cleaner. Staff is friendly and maintenance requests inside the apartments are attended quickly. It has been a nice experience so far. We have been there for three years now. There are always ways to improve. Improvements have already been made and they are nice. But for the most part it is a nice place. Still checking this out and testing to see if it is worth five stars. Will update ratings when there is more to say about this site. Currently it is not opening iTunes to download the app but I don't mind visiting the site. Thank you for taking the time to review Heritage on Millenia. Love the community. We've lived here for the past 4 years and we have enjoyed it very much. Apartments are nice and decent for the price. Community is calm and staff is very friendly. Only complaint is not enough parking EVER! Thank you for taking the time to review Heritage on Millenia. Long term residents, like yourself, let us know that Heritage on Millenia is truly a home and not just "an apartment" . It is our pleasure to do all we can to make your home happy and comfortable. Some problems with gate card it doesn't work but they gave us provisional one. Besides a few small issues in the apartment like scratches or noises on washer nothing to complain about.